To be successful in this event, talent alone will not suffice. You will need proper training from a knowable coach to be consistent in all these three phases of the technique. Here are some workouts only known to the better jumpers that will help you to become successful as a high jumper. Sit on the floor and stretch out your legs to the front. Swing your arms one by one as in running and try to raise your bottom from the floor without bending your knees or placing your hand on the ground. You won’t be able to do it. Now, while you remain seated, have both your arms behind your body keeping your elbows bent at 90o. Swing both arms vigorously to the front of the body and stop suddenly when the triceps come parallel to the ground. If you do this correctly your bottom will have left the floor. This drill demonstrates just how important the arms are in generating force for jumping and therefore how you should use your arm when high jumping. 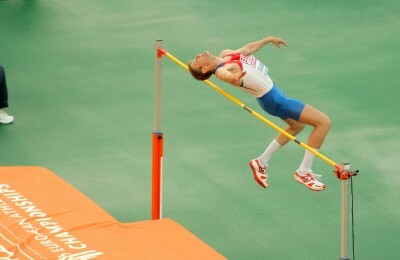 Visualization is a major part in any jumping event. To do this you should find yourself a quite place away from any noise or distractions, and just focus on jumping technique. To help yourself to become better at visualization, you can carry out this exercise: This is an old yogic practice involves fixing an unflinching gaze on an oil lamp or candle placed in front of you. You should then close your eyes and visualize the object. Repeat this exercise until you are comfortable. This practice steadily brings wandering minds to a focus. One of the most important, yet very difficult parts of the jump is to successfully coordinate the last three steps prior to the take-off. In these final steps, your body should be leaning away from the bar. Most jumper nowadays use the fosbury flop technique to clear the bar and the final few steps of the fosbury flop approach run is a curved run. The lean away from the bar at take-off is helped by executing the runway curve properly. The jumper should run the approach to the takeoff by leaning into the radius of the curve. The jumper’s center of mass is lowered in the penultimate step of the take-off and then the take-off leg is placed on the floor to drive the jumper into the air. If you were to take a picture of your body during the last step (the take-off) of the approach run, you should be able to draw a straight line from the top of your head, going through the spine, down through the takeoff leg on the ground. This position would help you transmit force to the ground and drive you into the air. And with the lean away from the bar, this will now give you the time to get up and over the bar successfully. As you approach the takeoff point of the jump your gaze should be focused above the bar. If you are looking at your feet, you cannot jump high. If you look at the bar, you will fly into it. If you see a picture of any international level high jumper, you will notice that they are all looking up and over the bar, this of course match their intentions. If you are new to jumping and want to learn how to high jump, here are some steps that should guide you. From "Secrets to Success in High Jump" Back To "Faster, Stronger, Better – Your Shortcut To Improved Athletic Performance"